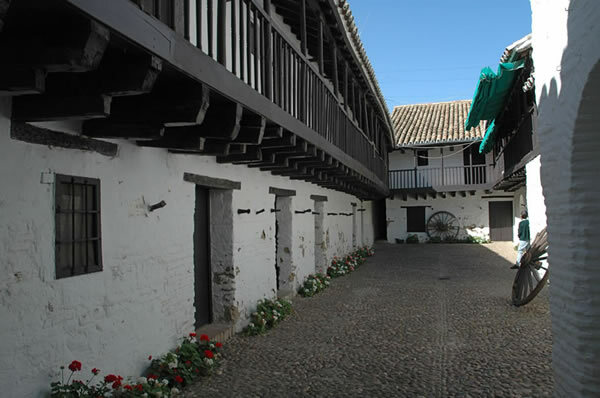 The Posada del Potro Inn is the oldest remaining in Cordoba and dates from a time when the Plaza del Potro and the surrounding areas were an important industrial area and hub for travelers. There are plans to open a Flamenco Museum here. The Potro (Colt) was mentioned in Miguel de Cervantes' universal novel "Don Quijote" (Part I). In this passage Don Quijote begs an inn keeper, who he images to be the lord of a castle, to dub him knight. The Inn Keeper plays along, and his response is full of the picaresque humor typical of Cervantes. Incidently, the author once declared himself a native of Córdoba during a trial in Seville. "I looked for no less, my lord, from your High Magnificence," replied Don Quixote, "and I have to tell you that the boon I have asked and your liberality has granted is that you shall dub me knight tomorrow morning, and that tonight I shall watch my arms in the chapel of this your castle; thus tomorrow, as I have said, will be accomplished what I so much desire, enabling me lawfully to roam through all the four quarters of the world seeking adventures on behalf of those in distress, as is the duty of chivalry and of knights-errant like myself, whose ambition is directed to such deeds." The landlord, who, as has been mentioned, was something of a wag, and had already some suspicion of his guest's want of wits, was quite convinced of it on hearing talk of this kind from him, and to make sport for the night he determined to fall in with his humour. So he told him he was quite right in pursuing the object he had in view, and that such a motive was natural and becoming in cavaliers as distinguished as he seemed and his gallant bearing showed him to be; and that he himself in his younger days had followed the same honourable calling, roaming in quest of adventures in various parts of the world, among others the Curing-grounds of Malaga, the Isles of Riaran, the Precinct of Seville, the Little Market of Segovia, the Olivera of Valencia, the Rondilla of Granada, the Strand of San Lucar, the Colt of Cordova, the Taverns of Toledo, and divers other quarters, where he had proved the nimbleness of his feet and the lightness of his fingers, doing many wrongs, cheating many widows, ruining maids and swindling minors, and, in short, bringing himself under the notice of almost every tribunal and court of justice in Spain; until at last he had retired to this castle of his, where he was living upon his property and upon that of others; and where he received all knights-errant of whatever rank or condition they might be, all for the great love he bore them and that they might share their substance with him in return for his benevolence. He told him, moreover, that in this castle of his there was no chapel in which he could watch his armour, as it had been pulled down in order to be rebuilt, but that in a case of necessity it might, he knew, be watched anywhere, and he might watch it that night in a courtyard of the castle, and in the morning, God willing, the requisite ceremonies might be performed so as to have him dubbed a knight, and so thoroughly dubbed that nobody could be more so.